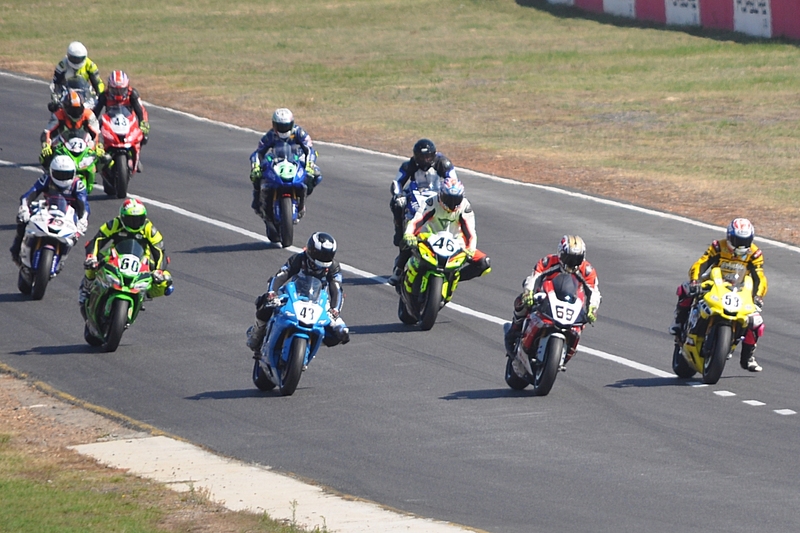 Hayden Jonas and the Samurai R1 continued their unbroken winning streak in the 2019 RST Suzuki South Superbike Championship at Round 2 of the Power Series sponsored by Wingfield Motors at Killarney International Raceway on Saturday 16 March, with pole position and two emphatic race wins. He had to work a lot harder than he was ready for in the first outing, however – and it was all his own fault. In only his fourth race start on the R1, Jonas incorrectly applied launch control and got one of the worst starts of his career. After fighting the bike off the line, he was 12th coming out of the first corner, but then steadied his nerves and began slicing through the field. By the end of lap one he was up to sixth, he was third behind Ronald Slamet (p/m motorsport R1) and Gerrit Visser (Yamaha R1) on lap two and by the time three tours had been completed he was second behind Slamet, his only serious rival so far this season. He chased the Namibian for three laps before blitzing him into Kfm Corner at the start of lap seven and came home, four laps later, to take a cliff-hanger win by just 0.314sec. Rapson dropped back in the closing stages, while Visser and Trevor Westman (Mad Macs ZX-10R) fought it out for third, with Visser pulling away in the closing stages to annex the final podium position. Kewyn Snyman came in fifth overall on the Hillbilly R6, the first Super600 home, just 1.152sec behind Westman and the only 600cc rider to mix it with the litre-class leaders. Jonas made no mistakes at the start of Race 2, led the charge down to Kfm Corner and romped away to win by more than five seconds from Slamet, with Westman pipping Visser for third by just 0.390sec. Four seconds later Snyman came home fourth overall, ahead of Rapson, who beat Quintin Ebden’s Milu R1 for SuperMasters honours in a cliff-hanger 0.148sec finish. Willem Binedell and his Dog Box ZX-10R showed Joske Kotze (JB Skips ZX-6R) the way home in the first RST Trac Mac Clubmans race, finishing less than a second in front, with Shaun Mackrill (GFP Lighting ZX-10R) third, ahead of Wayne Arendse and Gareth Kenward, each on a Kawasaki ZX-10R. Arendse took the fight to Binedell in Race 2, leading the first lap and a half and chasing the Dog Box bike all the way to the line, with Kotze a very close third in a thriller finish. 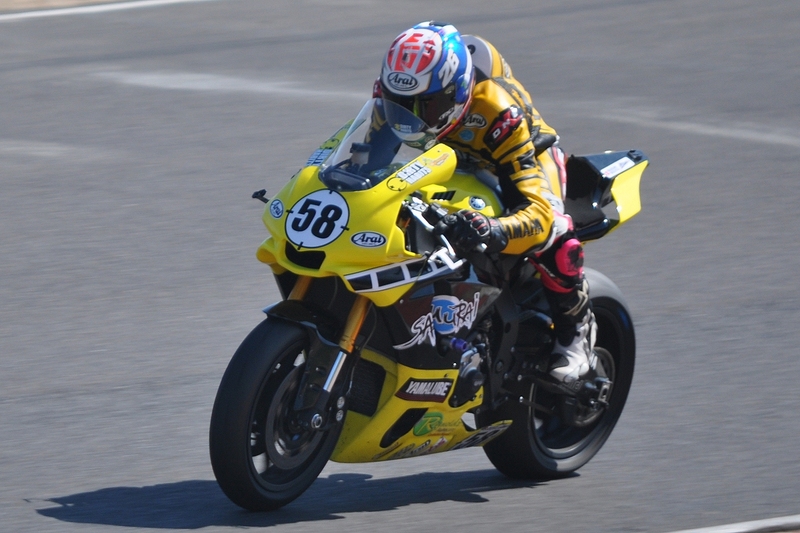 Kenward finished fourth, ahead of Shamier Alexander (Amlay’s R6), Deon Ebel (Honda CBR1000 RR) and Mackrill. Robby Pedrica (Yamaha R1) took the overall Breakfast Run honours, while John Kosterman (Suzuki GSX-R1100) led the Classic charge in both races. Paul Medell (Kawasaki ER650) walked away with both Powersport races, winning the first by 13 seconds from Joske Kotze (the same, on the JB Skips ER650 this time) and Ezio Miglietta (Kawasaki ER650) who finished in that order, less than a second apart. Tony Sterianos (RST RC390) led home the charge of the light brigade in the dice of the day as he, Jason Linaker (Samurai Ninja 300), Grant Raeside (Kanasnail EX300) and Andrew Thompson (MHM/Thruxton ER650) finished almost in line abreast, covered by less than a quarter of a second. Medell’s advantage in Race 2 was more than 16 seconds, but Kotze and Miglietta put up a splendid duel for second and third, swopping places several times before Kotze pulled a three-second gap to settle matters in his favour. The battle for Class B honours was almost as intense as in the earlier outing, with Raeside, Sterianos and Linaker finishing in that order in less than a second.